The year was 1987: The Whipping Boy by Sid Fleischman won the Newbery Award and Richard Egielski took home the Caldecott Medal for Hey, Al. Ronald Reagan was president, The Simpsons debuted on TV, and the WVLS Youth Services Workshop launched a Northwoods tradition. The WVLS Youth Services Workshop held in Rhinelander on March 10, 1987 featured Cooperative Children’s Book Center Director Ginny Moore Kruse. The program was so well attended – not only by WVLS school and public librarians, but also by neighboring systems – that it created a groundswell of support for an annual event. The Cooperative Children’s Book Center (CCBC) is a non-circulating collection of children’s literature for adults, a book examination center and research library. Each year the CCBC reviews almost all trade books published for children and young adults. The CCBC helps librarians, teachers, reading specialists and parents in Wisconsin spend their book dollars wisely by giving them an opportunity to see recommended titles before purchase. 2017 attendees examine children’s books. The 1987 WVLS workshop filled the Claridge Motor Inn dining room. 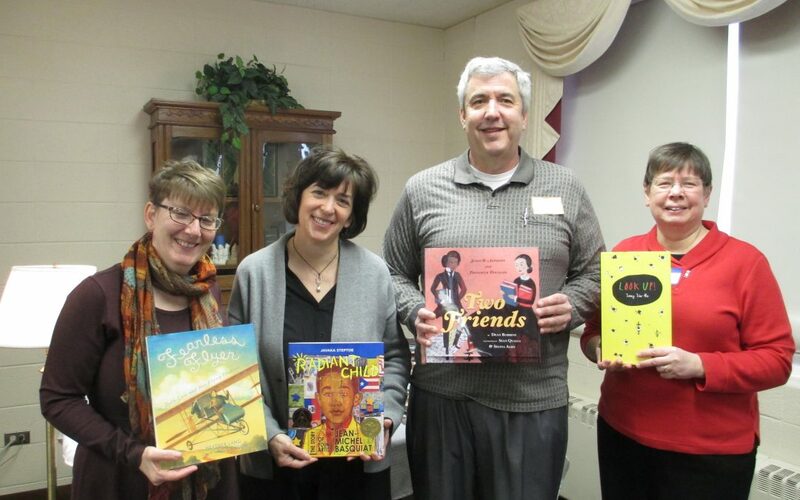 Participants had the opportunity to learn about current trends and examine the best new children and young adult books without traveling to Madison. With WVLS taking the lead, a coalition of support for an annual Children’s Book Fest was formed with Northern Waters Library Service (NWLS) and Indianhead Federated Library System (IFLS). Rhinelander was centrally located to draw attendees from 26 north central Wisconsin counties. Volunteers organized registration, publicity and arrangements for back-to-back evening and day programs which became the prototype for similar gatherings in other parts of the state. Children’s Book Fest “Founding Mothers” were Gyneth Slygh (Library Media Director, School District of Rhinelander), Joan Belongia (Headwaters Reading Council), and Kris Adams Wendt (Children’s Librarian, Rhinelander District Library). In addition to marking three decades of celebrating children’s literature in the Northwoods, this year’s event included a special tribute to Joan’s longstanding devotion to connecting young readers with excellent books before her untimely passing on October 22, 2016. Complimentary copies of 2017 CCBC Choices will be distributed to all WVLS public libraries via courier.